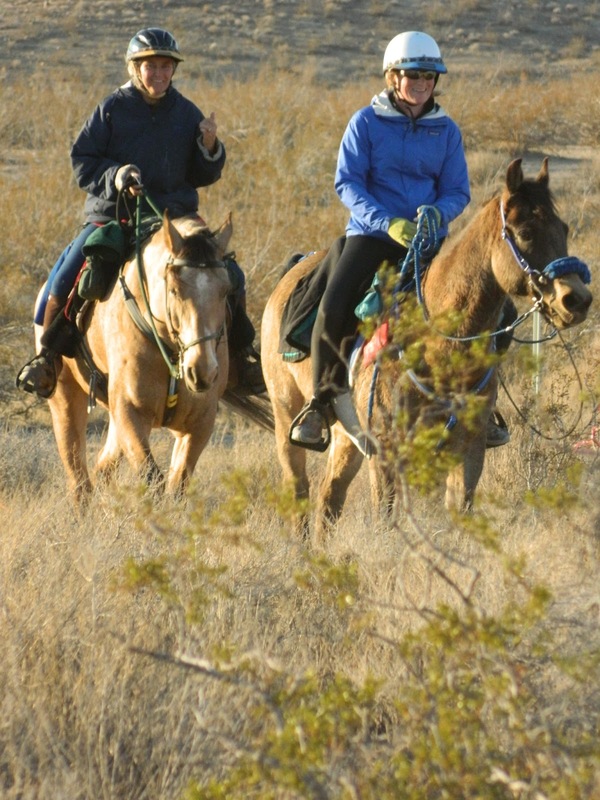 Crewing 20 Mule Team; or, Isn’t Endurance Riding Glamorous? I’m getting caught up on last weekend’s sleep just in time to probably end up short on it again this weekend…and then repeat the process for the following week/weekend. Life is crazy busy but I love it. This upcoming weekend is the Sonoita ride, then the following weekend, I’ll be attending the AERC Convention in Reno, NV and running the Renegade booth at the trade show. 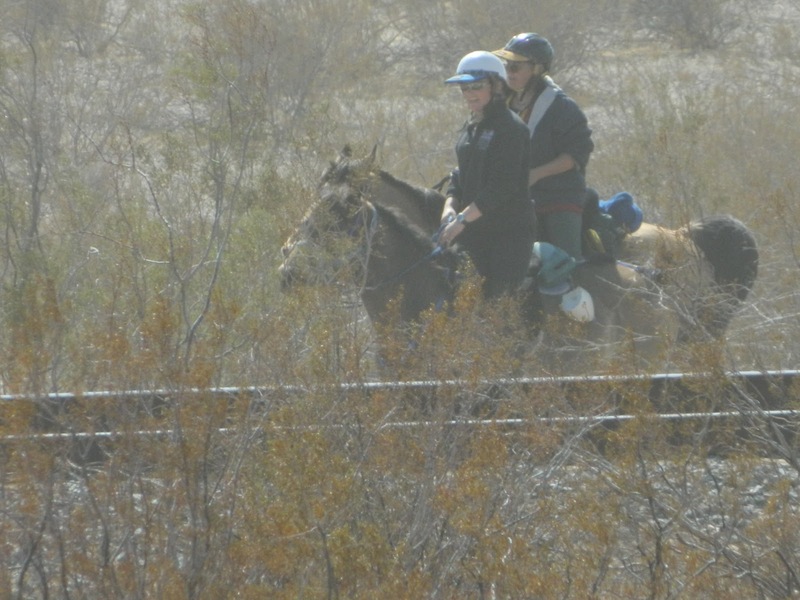 Anyway, the reason for last weekend’s lack of sleep: Crewing the 20 Mule Team ride for friends Kaity and Lucy, riding the 100-miler. It was a whirlwind weekend and I felt like I was gone for a lot longer than I actually was. This time, I decided to fly out. Two factors: One, Ridgecrest is an almost-1000-mile round trip drive for me and I don’t want to be putting those kind of miles on my somewhat older, already-high-mileage vehicle; and two, I drive a gas guzzler. Flying and renting a car turned out to be cheaper than just driving. I felt rather grown-up, driving myself to the airport Friday morning and leaving my vehicle for the weekend (uttering the universal traveler’s prayer of “Please let my car be there and not in pieces or non-functioning when I return”). What’s to say about the flight? I flew into Bakersfield, so the trip was short and the plane was small. The advantage of flying into a smaller regional airport is things like getting baggage and a rental car typically go pretty fast, so I was on the road faster than I had anticipated. The drive over to Ridgecrest is gorgeous along Hwy 58, passing through the Tejon Ranch and Tehachapi. 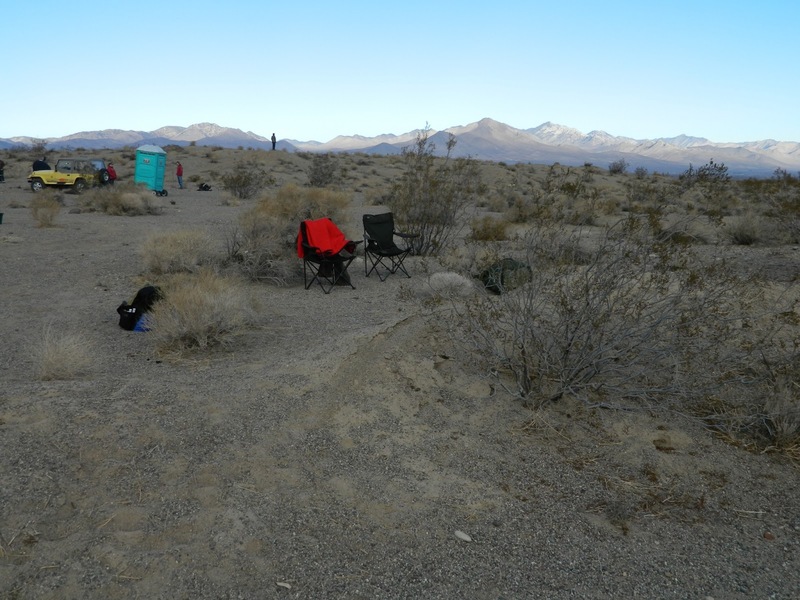 Ridgecrest was somewhat familiar turf, having been there just last month for the Fire Mountain ride — the only difference this time around was a different base camp. I managed the drive in about two hours and showed up early afternoon, with plenty of time to socialize, perform Renegade-related duties, help Lucy glue on boots (the start of the “Isn’t endurance riding glamorous?” theme as Fergus sneezed on us, rubbed on us, smeared glue on us, and in one memorable moment, narrowly missed pooping on Kaity…), watch them vet in, pack crew bags/boxes/coolers, then finally sit down for a laughter-and-endurance-rider-war-stories-filled dinner. Lucy eyeballs Fergus’s freshly-applied boots. 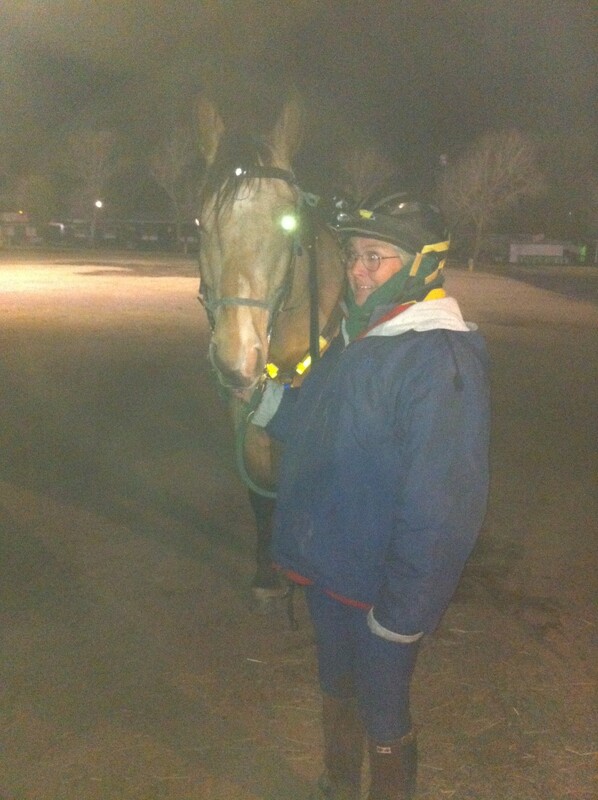 Kaity heads out to pre-ride. Lucy vets in Golden Boy. We probably shuffled off to bed later than we should have (considering the 6am ride start the next morning), but sitting around drinking wine and laughing with friends is just too much fun and none of us were ready to call it quits at an early hour. I was “that person” in line at Starbucks: The one you hope you never get behind because they have a large order that holds up all the proceedings. Heh. Four drink orders and four breakfast sandwiches later, we were back on the road and heading to VC1. 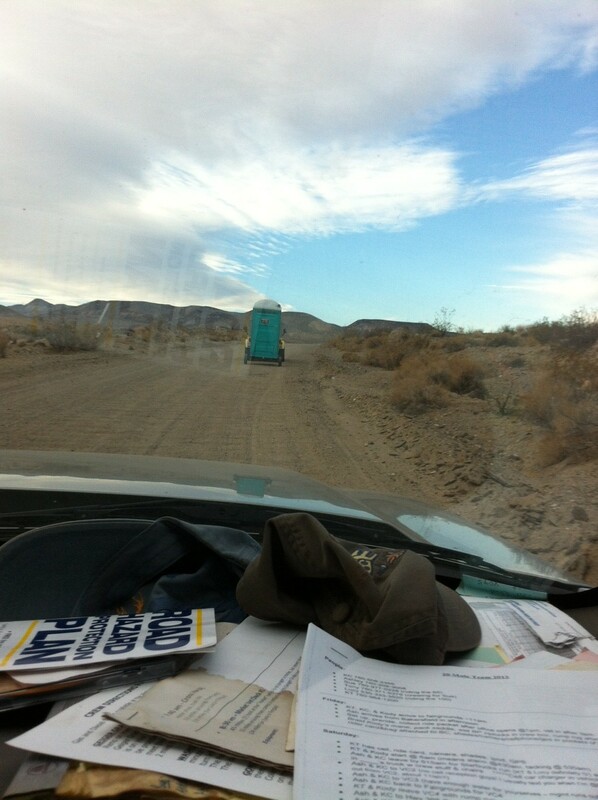 Following the Port-A-Potty into VC1. Fergus was already down when they arrived (for as big as he is, he is an athletic freak, especially metabolically), so Lucy vetted him through and we got both horse and rider settled with food and drink. Kaity and Kody showed up about 10 minutes later and went through the same routine. 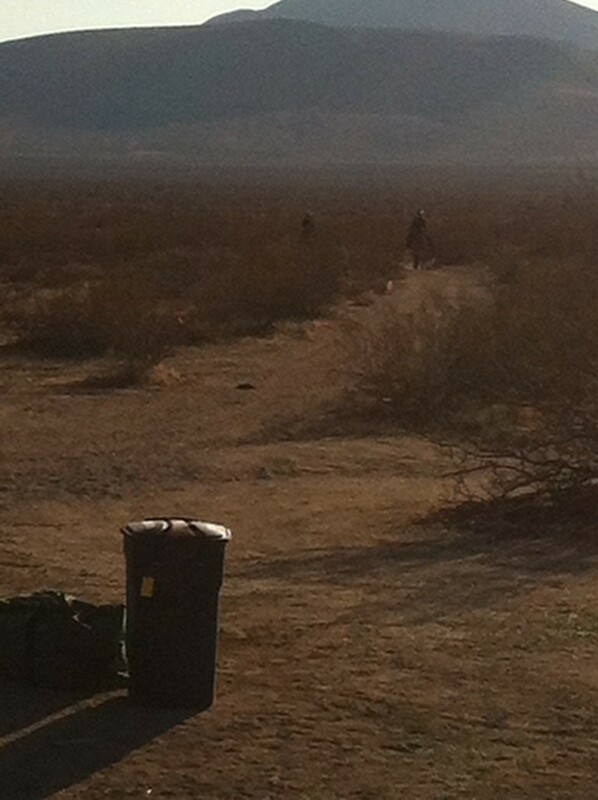 Cleaned up our area, dumped it all back in the truck, then we were off again, this time for VC2. 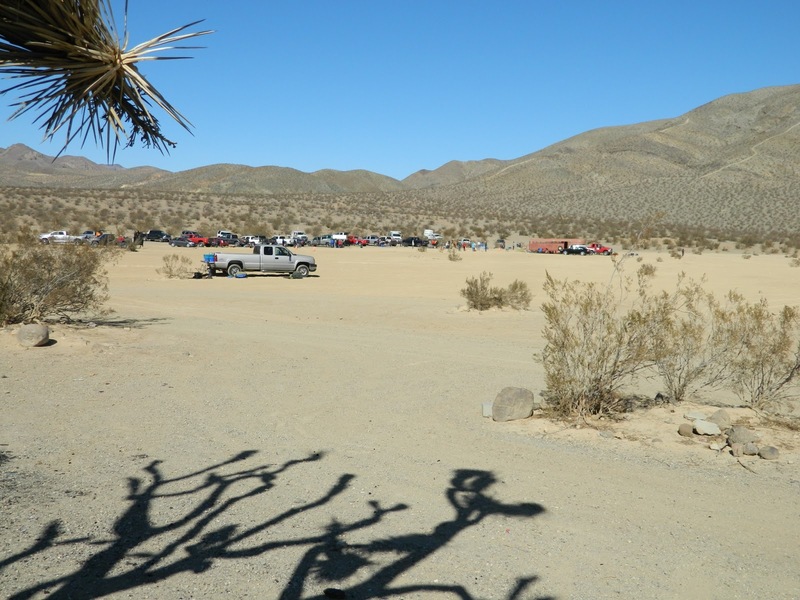 For those who have done the Death Valley ride in the past, where one of the days’ camp was located in the dry lake bed: VC2 was in the same location. It was quite windy when we got there, to the point where chairs wouldn’t stay upright without a body in them. Eh, no biggie. Try to position the truck as a windbreak and hold onto the doors as you’re getting in and out of the truck. We had been right in the middle of that cloud. And then it was time to go again. 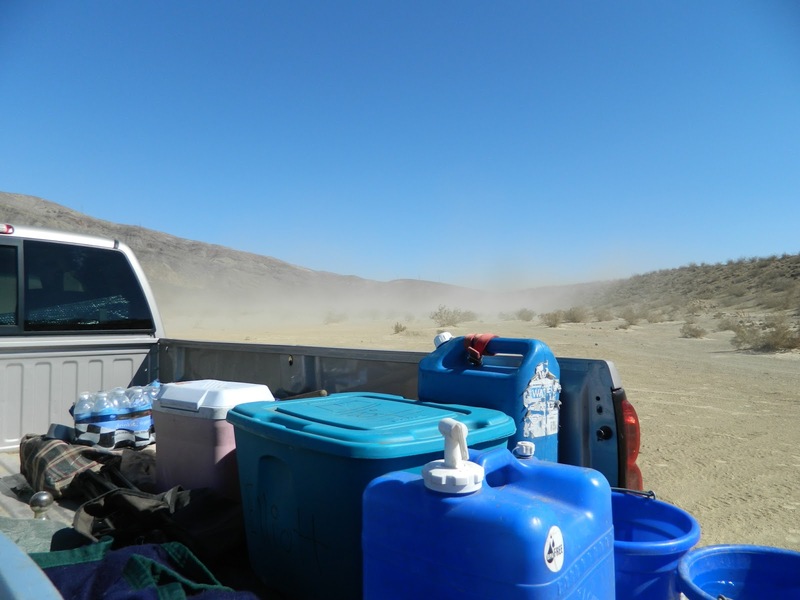 It was a relief to pack everything up and get out of the dust bowl, although it set the weather tone for the rest of the ride, and the wind never really did stop blowing for the rest of the time. We made a quick detour back to camp to pick up some extra clothing as requested, then back to VC3. 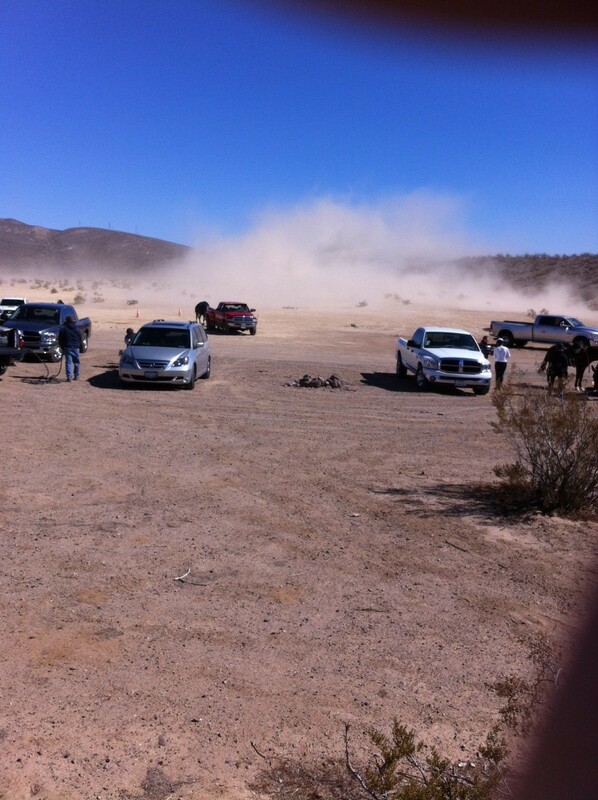 At least it wasn’t dusty. 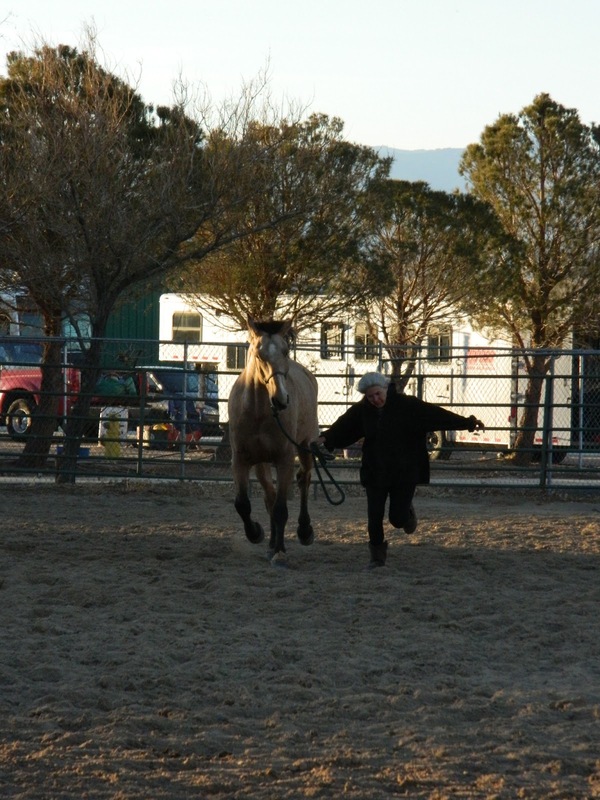 This one was another 20-minute hold and the horses came in starving. Kody was firmly into “nomming everything in sight” mode and I’d finally found a mix that tempted Fergus: Beet pulp and LMF feed. And alfalfa. And carrots. They vetted through looking great and munched for the rest of the hold while Lucy changed tights to a non-rubbing pair. Loop One, 65 miles, done! 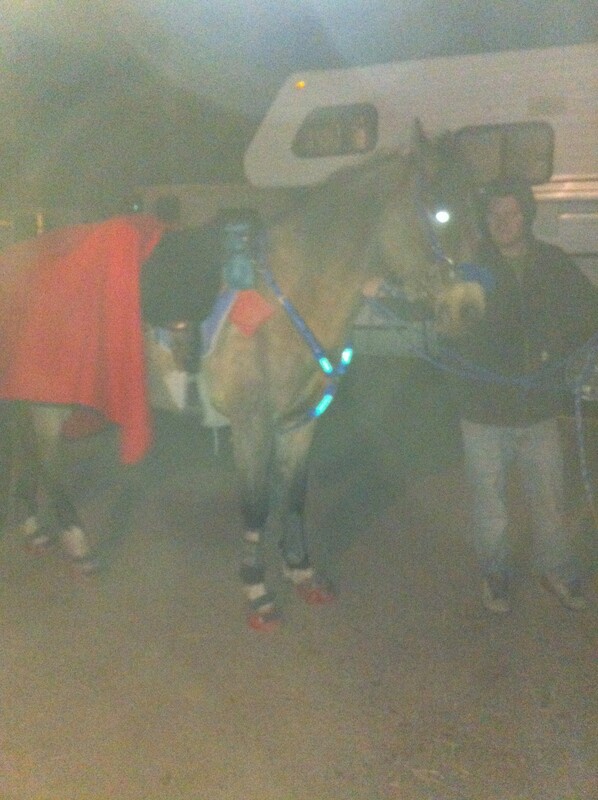 I had to laugh as I elected to carry Lucy’s saddle back to the trailer. I had mistakenly thought that treeless saddles were supposed to be lightweight…and hefting it back up onto 16+hh Fergus would be more work than carrying it. Ah, well. Got my upper body workout. 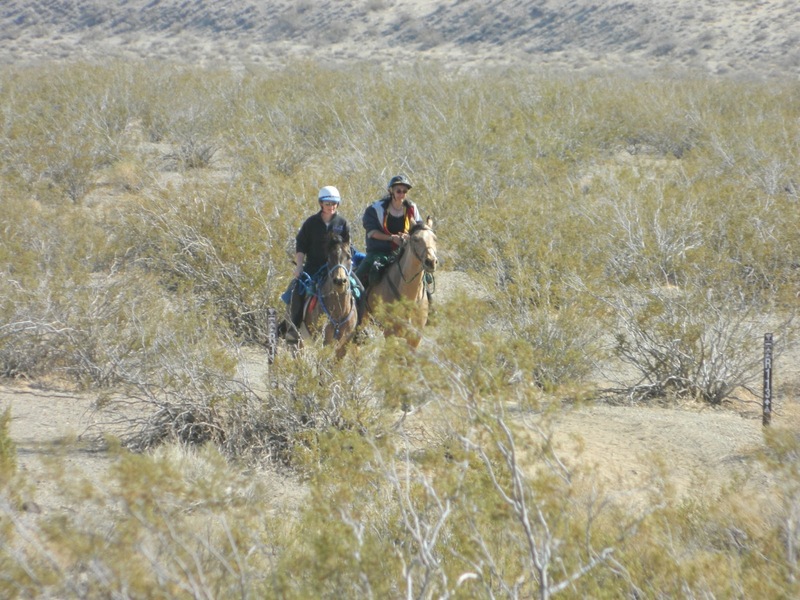 It was cold and windy, so we urged them out of there before the horses could get cold, then we headed over to VC5 — last check and same location as VC3. We actually had enough time before their anticipated arrival (Kaity had done meticulous timing sheets based on her ride here last year and Lucy’s ride in 2010, so we had a really good idea of when to expect them and how long it would take between sections; plus Kaity would text approximate ETAs) to grab a quick nap in the truck…I think I managed maybe 20 minutes before waking up, worried I would miss a text — or worse, their arrival. The horses came in absolutely starving and munched non-stop for the next 15 or so minutes while Kaity and Lucy sat in the truck and raided their own food stashes. I’d replaced the cable on Kaity’s boot while we were waiting, so swapped the boot back to the original. I got really, really cold standing out in the wind tending to the horses, despite wearing three layers of jackets, so getting in the warm truck and heading back to camp felt really good, and once back in camp, I bundled myself into Lucy’s trailer, turned on the heater, and sat in front of it for a while as I boiled water and made some hot soup and hot chocolate. I also laid down for about 15 minutes, and after some food and rest, didn’t feel as pathetic and shivery. I scrambled around camp, making sure everything was set for their arrival, then we headed over to where they’d be coming in, blankets and hay in hand. Roughly 10 (or so…) minutes later, we saw glowsticks approaching in the distance. 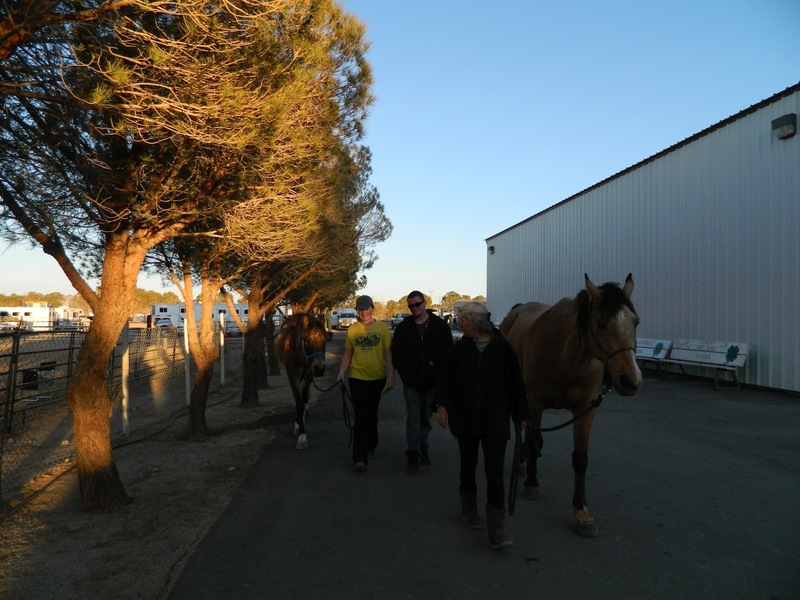 Once back at the trailer, I had laid out a gourmet buffet of pretty much everything edible, and they dove in. Untacked, covered in fleecies and blankets, legs wrapped — Fergus a dry wrap, Kody poulticed (still digging poultice out from under my fingernails) and wrapped — and left with enough energy to change into pajamas and crawl into bed. Sunlight and whinnying horses all conspired against me by 8AM, at which point Lucy and I both reluctantly admitted we were awake and should probably get up, even if we really didn’t wanna. We did go over to watch the BC judging for the 65s and 100s…some really excellent-looking horses who didn’t look like they’d gone their respective distances. The rest of the morning was spent with the ride breakfast/awards, some more Renegade business, then gathering all of my stuff back together and packing up camp. Oh, and there was a brief break in their for a shower — a SHOWER!!! — and the chance to wash the lake bed off, which is probably why I didn’t actually turn my bathtub brown once I got home. Holding a ridecamp at a fairgrounds, with things like permanent bathrooms and showers and tables, is very civilized and I like it. I was kind of dreading the drive back to the airport, knowing how fuzzy-brained I was feeling at that point. So I stopped at Starbucks for caffeine and some sustenance to munch on, then once I got on the road and through the parts where I had to remember where I was going, called over to Renegade Headquarters to give my weekend play-by-play report. Chatting with Kirt and Gina took up probably close to an hour, so by the time I finished with that, I was well into the “pretty” part of the drive by Tejon Ranch, so that was enough to keep my interest, and then I got close to Bakersfield and had to pay attention to where I was going again, so managed to get myself to the airport in fine shape. 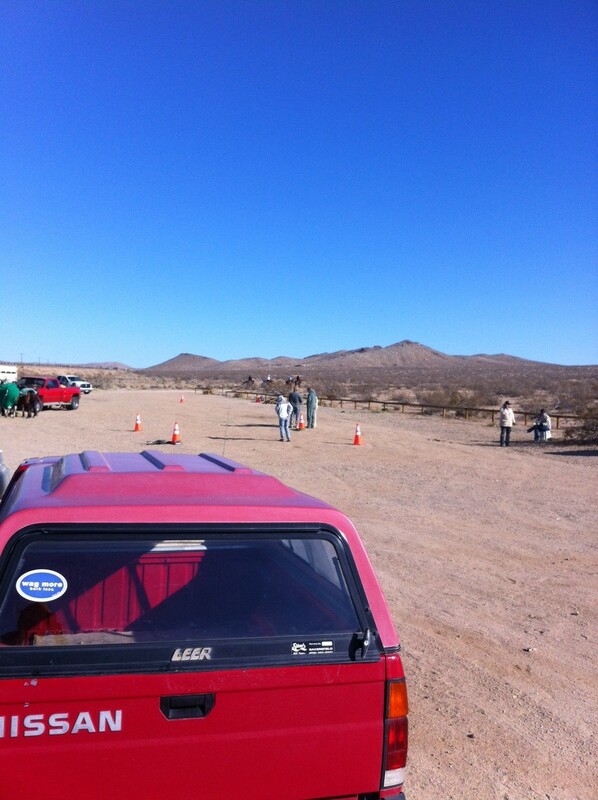 Of course, me being me, I had left Ridgecrest with the intent to allow plenty of time for any mishaps along the way. Nothing happens…so I found myself with about 3 hours to spare before my flight. Ah, well…that’s what books are for. And I do have to make one comment…the one good thing that came out of the (still-blowing) wind: My flight got in half an hour early. That was a pleasant surprise. Yay, tailwind. I’m mostly caught up on sleep now (as I sit here trying to convince myself I absolutely do not need another cup of coffee) and in the thick of packing and getting ready for leaving for Sonoita Friday morning. With a ride like 20 Mule Team, it’s definitely less intense. But I felt like I did a lot more, with 6 stops (5 checks plus the hot chocolate stop, plus the finish), all of which involved crew assistance. There wasn’t the time-clock pressure: We had a really good idea of when to expect them coming in to checks, and the furthest drive we had was maybe half an hour from check to check. And I had a blast. There’s something immensely satisfying in knowing you helped someone’s ride go that much smoother and helped contribute, in part, to a successful ride. And time spent with such great friends is always enjoyable. 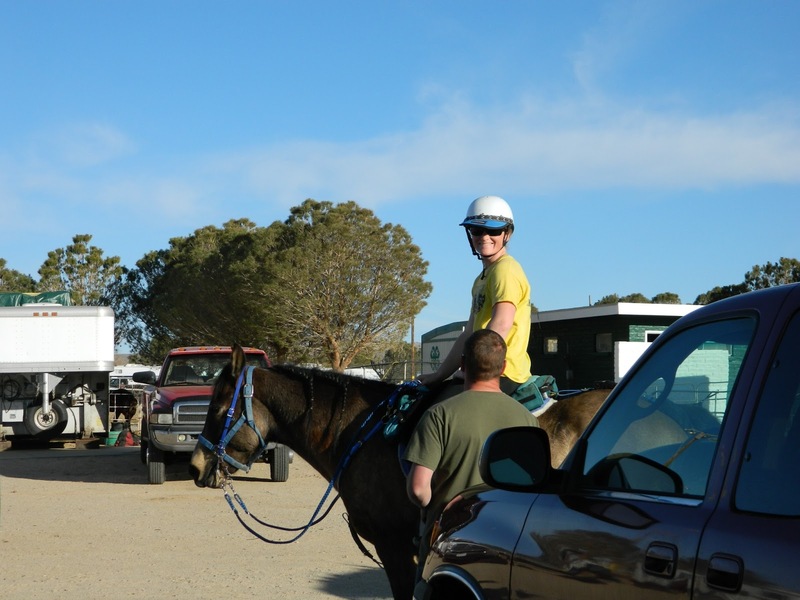 And crewing is a great way to get the feel for a ride and what to expect when riding it…especially since I intend for 20 Mule Team to be my first 100 when that time comes. And now it’s back to my packing and list-making for Sonoita. This sounds like fun… endurance style that is. I think we kind of like being dirty and tired at the end, lets us know we did something worth doing. That was a in interesting post. I've never spent much time around the 100milers (wimp here) I'm ususally too exhausted after my LD to stay up that late:) The horses look great- good job to all!